I am lucky with my neighbours. At the moment, I live next door to the core of the musical group EnsembLeChatNoir, who give beautiful – and sometimes multimedia – concerts. At my previous house there was also an artistic neighbour, a cermist. She is from Germany, and when she and her husband came for dinner I had prepared a meal with historical recipes from her native country. 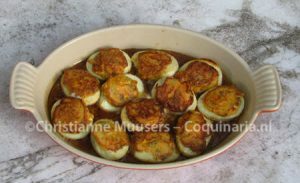 The first course consisted of medieval stuffed eggs, the main course was Capon à la braise from the nineteenth-century cook and writer of cookbooks Henriette Davidis. The dish with stuffed eggs has some resemblance to the Split Nuns from the Dutch Notabel boecxken from 1514, but it reminded me also of some recipes from medieval Arab cookbooks. 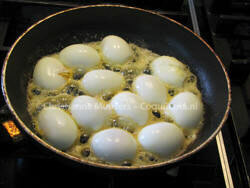 Many recipes were finished off by pouring raw, stirred eggs over the hot food just before serving. The same happens in this recipe. There is also an extra egg in the stuffing of the eggs. So, anyone who has to watch their cholesterol had better stay away from this recipe. The recipe comes from an anonymous cookbook without title (Cod. 1213 Helmstedt, Herzog August Bibliothek, Wolfenbüttel, ff 81r-109v), which today is known as the Mittelniederdeutsches Kochbuch (Middle Low German Cookbook). The manuscript dates from around 1500, and is mainly filled with medical treatises and recipes. Some texts are written in Middle High German, others in Middle Low German. 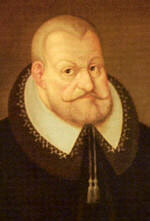 According to Hans Wiswe, who published the cookbook in 1956, the manuscript was written in a convent and confiscated in 1575 by the protestant duke Julius von Braunschweig (1528-1589, see portrait left) together with the libraries of all cloisters in his duchy to fill out the contents of the library of the university Helmstedt which was founded by him in 1568. In the recipes of the Mittelniederdeutsches Kochbuch sugar is hardly used, but honey all the more. In this regard medieval German cookbooks in general distinguish themselves from French, Italian, English (and Dutch) cookbooks in which sugar is the standard ingredient and honey the exception. The Kochbuch has many recipes as relatively many recipes, one in six, for mus (purée) made of fruit (grapes, apple, cherries, blackberries, quince, plums), walnuts, parsley root, comfrey, hemp, rose leafs, and with meat (liver, chicken). Ground peas are used in a dough with honey and meal that is baked in moulds, and there are several recipes for eggs, and fake eggs made of pike roe. Other main ingredients are fish (pike and pike roe, but also herring, stockfish), crayfish, meat (mainly chicken and pork), milk, almond milk, and fruit (aplle, pear). Recipes with vegetables as main ingredient are limited to one, the purée of parsley root. The cookbook has recipes for sausages, a few pasties or pancakes, and one blancmange. In the stuffing of the eggs are used sage and krusemynte. So, that would be curly mint (Krauseminze in German, kruizemunt in Dutch). In his edition from 1956, Wiswe translated krusemynte with Krauseminze. But in his additional remarks from 1958 he concludes that probably another herb was meant, based on a fifteenth-century glossary which translates kruseminte with balsonie balsamita or Marienblatt. 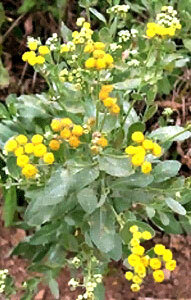 The modern scientific name of this plant is Tanacetum balsamita L., the English name costmary. Trude Ehlert mentions this in her Kochbuch des Mittelalters on p.77, but for her modern adaptation of the recipy she chose curly mint. Because how many people still have costmary in their garden? But in the past it was a popular herb, and its leaves were used to bookmark pages in the bible to keep away bugs. Another name for costmary is bible leaf. 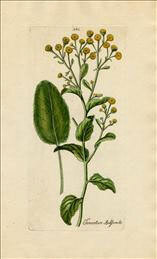 But costmary was seldom used in culinary recipes, it was a medicinal herb. 32. Item wyltu maken halve eygere, de ghevullet syn, nym eigere unde sede de hart. Snyt se mydden eyntwey. Nym den doder dar uth den wytten. Stot de doder yn eynen moser. Wen se ghestot synt, so sla dartho roe eigere. Nym salvie unde krusemynte, peper unde safferan. Unde vulle den doder wedder yn dat wytte. So legge se in bottere unde brat se aff alle hart. Nym etick unde ander eygere. Make darover eyn gud so:et. Honnich, peper unde saffran do dartho. Solte dat tomathe. Unde giff dat hen. If you want to make halved eggs that are stuffed, take eggs and boil them hard. Cut them in two. Take the yolks from the whites. Pound the yolks in a mortar. When they are mashed, mix in raw eggs. Take sage and costmary, pepper and saffron. And stuff the yolks back in the whites. Then lay them in butter and bake them very well. Take vinegar and other eggs. Make a good sauce of these. Add honey, pepper and saffron. Salt to taste. And serve it forth. Not a lot of work. But a lot of eggs. For 4 to 6 persons; preparation in advance 15 minutes; preparation 20 minutes. Peel the hardboiled eggs and cut them in half lengthwise. Take out the yolks and mash them with a fork. Chop the herbs very finely. Add these to the mashed yolks, with pepper, salt, saffron-and-water and the raw egg. Mix well, and fill the egg whites with this stuffing. For the sauce, temper two raw eggs with vinegar, honey, pepper, salt. If using red wine vinegar, leave out the saffron. When you use white wine vinegar, add crushed saffron. Preheat the oven to 150 °C/300 °F. Melt the butter in a frying pan and bake the stuffed eggs, first with the stuffing on the bottom. Turn them over after two minutes and fry for another couple of minutes. Arrange the eggs in a casserole. Whisk the raw egg/honey-sauce and pour them over the stuffed eggs. Bake ten to fifteen minutes in the oven until the mixture has set.. Warm or at room temperature, as first course of a medieval meal, or as lunch or snack in a modern menu. This dish is not specifically meant for Lent, but it could be eaten during that period. Tanacetum balsamita, a perennial originating from the Caucasus. The plant was mainly used in medicine: against worms, for aiding menstruation and labour. It is an easy garden plant. 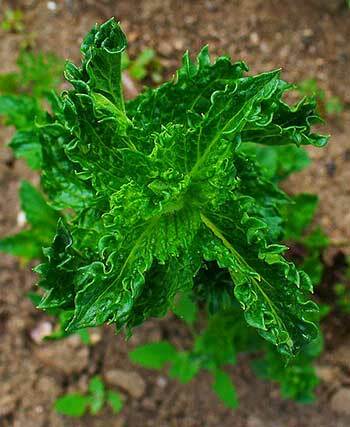 The Romans used costmary occasionally also in culinary recipes, and later it was used in salads and stuffings. The leaves have a bitter, minty taste and spreads an odour that not everyone likes. It was also used to bookmark pages in the binle, hence the name bible leaf. A nice addition to your herb garden. This is simply a variation of Mentha spicata (spearmint), but with curly leaves (Mentha spicata var. crispa). There are many kinds of mint, like peppermint, a hybrid from spearmint and water mint (Mentha aquatica). If you plan to have mint in your garden, you must be watchful: it spreads throughout the border and in my garden it even tried to cross the path. For use as kitchen herb, take care to remove the flower buds, because once in bloom the leaves lose a lot of their fragrance. On the other hand, flowering mint is attractive for butterflies and bees. A decorative perennial evergreen, Salvia officinalis. If you have the use of a garden, be sure to plant one! You can pick the leaves all year round. Classical combinations are with chicken livers, with onions as a stuffing for pork, and in several egg dishes. Be careful, the taste can become overbearing. 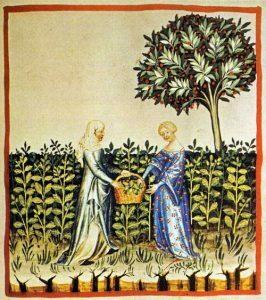 Originally sage was used as a medicine (as the Latin name shows), but by the Late Middle Ages sage also became an ingredient in recipes for food. Trude Ehlert, Das Kochbuch des Mittelalters: Rezepte aus alter Zeit, eingeleitet, erläutert und ausprobiert (2000). Hans Wiswe, ‘Nachlese zum ältesten mittelniederdeutschen Kochbuch’. In Braunschweigisches Jahrbuch 39 (1958), pp.103-121.